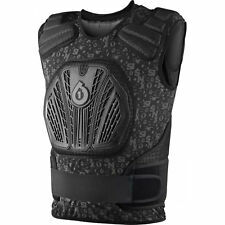 Blaster Protection Vest Large / X large. Blood Flow And Muscle Recovery With Compression Fit. OUR PRICE: £14.99. Cooling With Ventilated And Sleeveless Construction. BLASTER UNDER PROTECTOR. 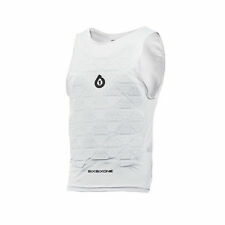 The Blaster Sleeveless Under Protector By Sixsixone. Lightweight Chest Protection For Both Climbing And Downhill Riding, Great For The Endure Guys Looking For Breathability With Good Ventilation But Still Added Protection. 661 D30 Evo Elbow 2 Elbow Guards. D30 elbow insert behind tough Kevlar material. - D30 material hardens on impact, yet flexes while riding. Take a look all pictures. What you see is what you are going to receive. SixSixOne Body Armor. 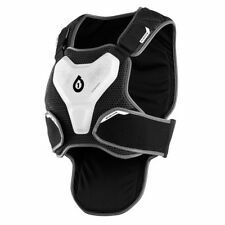 All new look for the Defender full coverage shoulder pads. Defender 2.5. 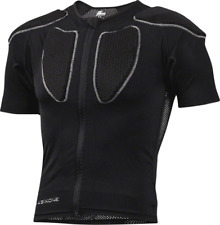 Just like our original Defenders, the Defender 2.5 features a raised chest "Zone" area creating a pocket of protection. Comp AM Elbow Pads. Internal flex tech rubber elbow protection. Injection molded ABS knee Cap Double layered biofoam Pre curved chassis design Neoprene backing Velcro Closures Material: 50% Neoprene, 20% EVA, 10% Plastic, 10% Polyester, 10% Nylon No se realizan envíos a Baleares, Canarias, Ceuta y Melilla. 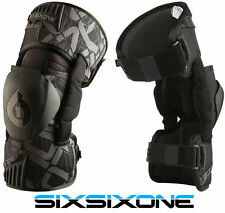 661 SIXSIXONE RAGE MOTOCROSS MX KNEE BRACES supports pads protectors enduro bike. Condition is Used. Make sixsixone. High-impact Lexan® chest, back, and shoulder panels. Type chest protector. Neck brace compatible. Floating shoulder pad system. Gender Unisex Adult. We will agree with you a solution. SixSixOne Knee Pads. Size (adult) Medium. SixSixOne knee pads suitable for mountain biking, skateboarding etc. Protective hard shell in grey with black and green accents. Hard shell is scuffed from use but pads have plenty of use left in them. Size is adult medium. Selling due to a massive clear out and downsizing. Also selling some stuff for friends, hence the varying sizes etc. I have loads more to list so please feel free to check out my other items and/or ask any questions you may have. Happy to combine postage on multiple items. Thank you, and happy bidding! Make sixsixone. High-impact Lexan® chest, back, and shoulder panels. Neck brace compatible. Floating shoulder pad system. Gender Unisex Adult.